Last week, I was saddened to hear of the passing of Anne McCaffrey. As most of my readers undoubtedly know, McCaffrey was a prolific science-fiction and fantasy author. Her Dragonriders of Pern series is her most popular work, and it had a great influence on me as a D&D playing teenager. 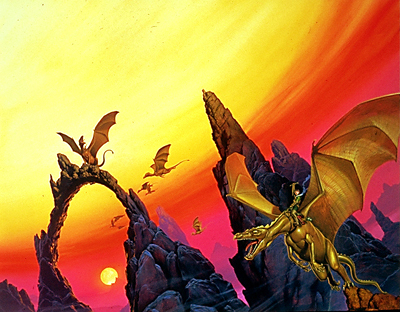 It is only fitting, then, that I dedicate this month’s D&Development to Anne McCaffrey and her glorious dragons. I came upon the first book in the series, Dragonflight, when I was in junior high. I was in the thick of my Dragonlance fandom, voracious in my consumption of dragon-related material. While browsing at a local bookstore, the spine of the book caught my eye, most likely due to its mention of my favorite fantastic creature. The cover itself was what sold me on the book. 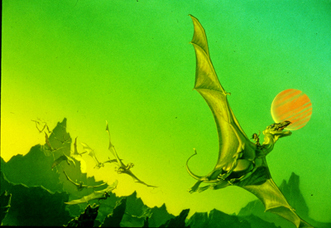 Michael Whelan’s illustration of an enormous, majestic, golden dragon soaring through a green sky struck me as incredible. I was a fan of the D&D art from the time, but this painting was much different, totally intriguing me. Though the book was categorized as fantasy, it was really more science fiction. There were no magic spells, wizards, and no orcs or goblins. There were, of course, dragons, but these magnificent creatures were far different than their D&D counterparts. Telepathically bonded to their riders, and able to teleport at will, the dragons of Pern were quite alien and yet somehow realistic. The different colors of dragons didn’t relate their alignment as in D&D, but instead represented different sizes or genders. Small greens and blues and even the larger brown and bronze were each dwarfed by the golden queens. The dragons were friendly and intelligent, working with their riders to defend Pern from the threat of dangerous space-born spores called Thread. These dragons obviously played against the stereotypes in fantasy literature, which I’m sure was McCaffrey’s intent. 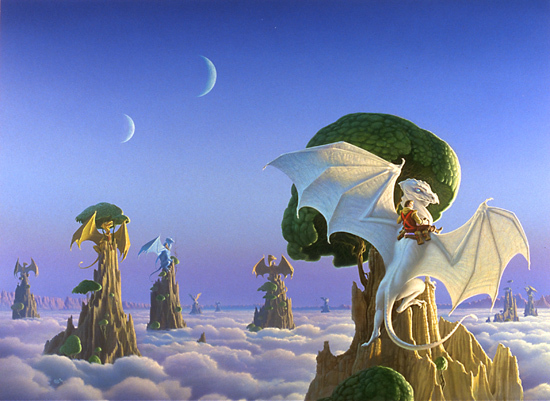 As impressive as the dragons were, the real appeal of the book, to me, came from the richly detailed setting. The society of an agrarian culture by itself would be quite mundane, but the ever-present danger of Thread, which consumed all living matter it contacted, made the stories compelling. People lived in fear, hiding in caves or stone buildings as the Thread fell. Bases full of dragons and their riders, called weyrs, were scattered across the world, in order to best patrol the skies. An elaborate, almost military system of defense had developed over the centuries. But during a particularly long period without the fall of Thread, all but one weyr had been abandoned, and the dragonriders were barely able to survive, since most people considered Thread to be a myth. This was where the story began. All this background information might sound complicated, and it really is. But to me, this just goes to show you how imaginative and yet natural the world of Pern was. McCaffrey had created a speculative, yet very believable world. This is what the best science fiction is all about, in my opinion. By carefully crafting a world that was fantastic and different, yet still made sense, McCaffrey’s Pern became one of my favorite settings in any medium. Though it wasn’t the typical D&D world, the Pern books certainly ignited my imagination in a way that few other series ever did. The political intrigue and strong characters from the books would influence my campaigns. I used good dragons in my stories often, many of whom acted like or were even named after those in the Dragonriders novels. I have tried to keep my campaigns as logically consistent yet still fantastic as the Pern stories, though I of course cannot hope to live up to such a high standard. 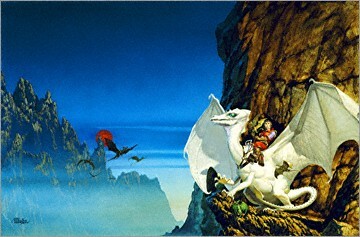 Recently, I reread the entire Dragonriders of Pern series from the beginning, and my enjoyment of it as a thirty-something adult had not diminished from my teenaged fervor. The books are every bit as good as I remembered them, and frankly have aged better than many D&D novels I read in the same time period. Thank you, Anne McCaffrey, for creating such a rich, lovingly detailed world to share with the rest of us. You will be missed. Next Game Night Blog Carnival: Get Bit!